Most small business owners and managers are well aware of the need for point of sale software and accounting software. They know that these advanced programs offer worlds of benefits compared to old-fashioned cash registers and manual spreadsheets. But many are still not aware of how these software systems can work together with even more types of specialized programs to completely automate the majority of their business processes. One of the most common examples of a powerful integration that business owners miss involves an HR software Deputy. Deputy takes some of the most time-consuming and headache-inducing tasks related to staffing for small businesses and makes them simple — even pleasant. When small businesses integrate their POS software with HR software directly, they can get even more out of both systems. If you’re considering integrating Vend and Deputy, you could be unlocking a very powerful solution for your business. Here’s what you should know about the integration. At Cloudscape Technologies, our goal is to empower business owners in the search and set up of the perfect combinations of cloud-based software for their businesses. We specialize in working with small- and medium-sized businesses, specifically those in the retail and restaurant industries. We are very selective about the software programs that we recommend for our clients, and we only get officially certified in the programs that we can recommend without hesitation. These programs all have smooth integrations with other software programs, are easy for administrators and employees to use, and come with a cadre of reports and time-saving features. We also only work with cloud-based software. If you’re still unfamiliar with the term, this software runs with the use of the internet from cloud-based servers and has many benefits over traditional, “legacy” software systems that are installed directly onto hardware. Being internet-based makes integrations like the one between Vend and Deputy possible. It also allows the software to scale up and grow with businesses more easily, and tends to be more affordable for businesses as they are just getting started (the software only requires a nominal monthly fee for full use of its features). Vend and Deputy are two of the best cloud-based software programs on the market for what they do. They are both compatible with businesses of all sizes, including those with multiple locations. Vend also helps you develop better relationships with your customers by tracking their details and behavior, which can help you develop valuable loyalty programs. Perhaps best of all, it offers dozens of “add-on” for features from accounting, to email marketing to — as we’re here to discuss — staff management. Deputy workforce management software specializes in making it easier for businesses to schedule employees and to track their skills and activities. It comes equipped with a time clock, timesheet management tools, and staff communications tools, and it even has the ability for administrators to assign tasks and monitor which employees complete them. But perhaps the coolest features have to do with scheduling, which is often a huge thorn in the side of small businesses like restaurants. Deputy can automatically suggest and contact replacements for your staffers as soon as they notify managers that they’ll be missing a scheduled shift. Because employees’ skills (and performance) are tracked in the software, it “knows” which employees are appropriate to suggest for scheduling changes. Employees can even swap shifts on their own through the software with no need for management to get involved. Its auto-schedule feature automatically takes into account factors like sales forecasts, bookings, and foot traffic to estimate how many staffers you need. If you have the enterprise version of Deputy, it can even use third party data to inform how the weather or other major events will affect your staffing needs. In just a few clicks, Deputy will create a schedule based on your priorities (such as lowest cost, or shift priority). Using a system like Deputy may also help keep you in compliance with fair employment laws. Finally, it’s worth noting that Deputy even integrates with payroll software to easily get employees paychecks based on their hours worked. Separately, these tools can save hours and hours of administrative time and costly mistakes. But together, they offer even more valuable features. 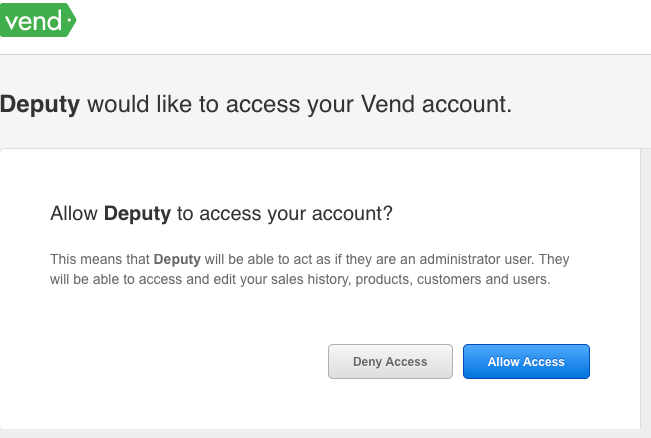 When Deputy and Vend are connected, all new sales entered through the point of sale will automatically show up in staff profiles in Deputy. This makes it easy for administrators to see which employees are ringing the most sales, and what they specialize in selling. Also, whenever a new user is added in Vend, that employee account is automatically created in Deputy, which ensures that both programs have up-to-date staff lists and cuts down on duplicate work. These reports can help managers see the big picture about how staff relates to sales. Smarter staffing decisions can save your business a lot of money. Smarter staffing decisions can save your business a lot of money. You won’t waste payroll dollars on over-staffing your store or restaurant on slow days, and you won’t lose out on sales and customer goodwill by failing to provide enough staff during busy times. You can use the data to incentivize your staff or to reward top performers, or simply to decide which employees to staff on your higher-demand days. Of course, for this and any other integration, you need to set up accounts in both software systems first. This should complete the integration. After this easy, five-minute task, you’ll be ready to start taking advantage of all of the advanced, time saving features we mentioned in this article for your business. If you want more customized feedback on adding Deputy to Vend, or advice on the many other software integrations available to you as a business owner, we hope you consider working with us at Cloudscape Technologies. We empower business through the important process of software selection so they can keep their businesses running at peak productivity. To get started with a free, no-obligation consultation, contact us at Cloudscape Technologies today.